Paula and the Pontiacs is a New Orleans band which will take you on a joy ride with some “gut-bucket” Blues, classic R&B, and soulful originals. The band is fronted by Paula Rangell (its originator since its inception in 1978). 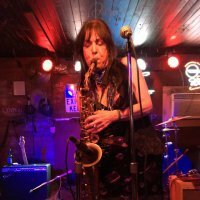 Paula is a small, pretty, power packed woman who wails on the alto saxophone, harmonica and lead vocals. Living Blues Magazine says “Rangell is a fine instrumentalist and, more importantly, an effective vocalist who has her timing and delivery down”. The band consists of a great lineup of Louisiana musicians. Paula Rangell grew up studying classical music on the clarinet at the age of seven. At 14, she picked up the harmonica with a growing love of the Blues. This love of the Blues and Jazz prompted the evolution of Paula as a saxophone player. Her instrumental influences range from the funky grooves of Lee Allen and King Curtis to the brilliant jazz of Charlie Parker and John Coltrane. Little Walter and Jimmy Reed were very influential on her harmonica playing. Vocal inspirations were Aretha Franklin, Etta James, Billie Holiday, Dina Washington and Ruth Brown to name a few. Paula and the Pontiacs was formed in 1978 in the Colorado region and then moved to Austin, Texas in 1981 where she played the local club circuit. She also has the pleasure of playing with and learning from internationally renowned jazz bassist Gene Ramey. Paula took part in Antone’s jam sessions that included playing with Mel Brown, Hubert Sumlin, Stevie Ray and Jimmie Vaughn, Kim Wilson, Angela Strehli, LouAnne Barton and Marcia Ball. In 1984 Ms. Rangell moved to New Orleans. She has played the Crescent City with such greats as Earl King, Little Queenie, Charles and Charmaine Neville, George Porter, Joe “Cool” Davis Gospel Group and John Mooney. During the 1984 World’s Fair, Paula played Dixieland on the Natchez and at the World’s Fair as well as many gigs with her own band Paula and the Pontiacs. Since 1984 Paula’s band has played extensively in the southern United States, Brazil, St. Croix, Kansas City Blues Festival and Mexico City with Deacon John. Paula and the Pontiacs were the winners of the KLON Longbeach national talent search for the southern U.S. in 1993. She has been endorsed by Hohner Inc. since 1987. In 1990, she produced her first release “Pontiac Blues”. In 1994, Paula released her CD “Cadillac Love” which showcases her musical ability and establishes Paula as a great songwriter. In 1997 Paula released “30 by 90” an all original CD followed by “Live at Ruby’s Roadhouse in 2000 and her most recent release in 2008 “Louisiana Bride”. The Bose Corporation licensed two of Paula’s songs for an audio compilation for 186,000 new Mercedes Benz sound systems. Paula lost her beloved home in New Orleans due to Hurricane Katrina. She now resides in the country outside of Folsom, Louisiana. Diagnosed with breast cancer in 2008, she is a survivor and now doing great.